The build is actually very easy, just extremely time consuming. The most tedious part of this build, is the troops, which you will need close to 52B of. Training is easier now with troves, though. Currently with a 5000% troop queue you can build 3.2m troops per round, being blessed, with the best gear and gems, and a 1500% queue boost. Research is the easy part, simply max all research for sh16. This will put you at just over, 5B research power. Building wise, you should be all barracks, all 16, and orbed for defense (all above 3%). You should have a watch tower, an alter, a prison (you can destroy sometimes so you don’t cap hero’s), and a forge. That’s it for normal buildings. Archeology building is lvl 15. As it sits, after troops and buildings, power will be around 1.1T. Gear is a 6 piece mix, with no set bonus. 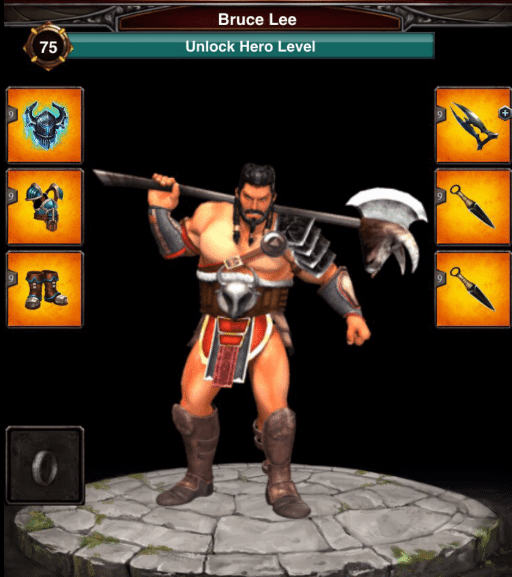 Helm is Haunted Frostlord, Armor/Feet should be Glacier King, Weapon is Jiao, and two kunai accessories. All gear should be boosted to 9. Out of all of traps, it’s the cheapest to build and maintain. Any time there is a rally increase or a new core set, simply increase troop count. Doing new research is not something that is required. The cool part is people hit the crap out of this account. Which is great for kill events. Usually you get maxed heroless solo’s because they can’t believe the size and think you are nerfed. You also end up getting rallied, capping, and having their friend rally as well, to try and save hero. 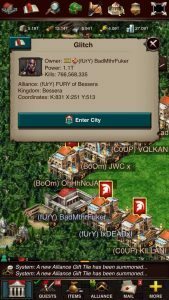 A BIG special thanks to lxDEADxl for the information provided, and help us test on his account. Definitely surprised us to see that SH16 traps are still possible after T5 release. We contacted KissMyCores to give it a test , and he ended up capping with no problem at all, defending with 700% boosts. Test still pending against a 50M Rally. Keep an eye on the blog for different builds, maintenance and tips. Gems are Bullwork, Ageis, and Defense gem. No 4th gem slot obviously. Wall traps are t3 reg since since there are only 50,000 of them. We keep the updated version in our premium section HERE. At current attack levels he would need something like 1,250,000,000,000,000 T3 to avoid burning so I suspect he’s too busy building up callouses on his thumbs to post an update. Any new updates on troop counts with the current new T6, research and rally march? 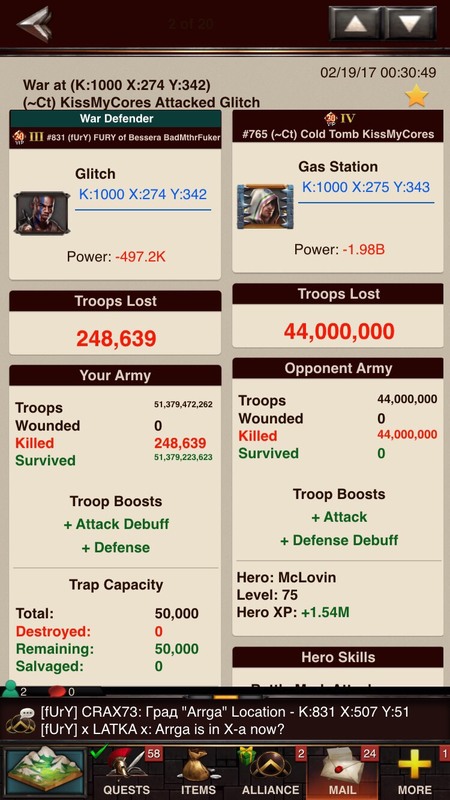 Thanks for the update, I was killing it running 8.5 Bil each T3 reg/wild 5 Bil Each t2 reg and 25 mil each T1 reg/wild… Any thoughts on this and or a ratio to it? also u mentioned boosting barracks to 20-25% what luck level is that? at 23-24 i was hitting 15s or do u mean individual health? I thought that I would give an update on things. Last night was our kvk and it was a blast. I capped 13 50 mill rallies, 22 solo marches, and lost track of the one troop marches and heroless marches. I was able to score 832 bill points. So these traps do work very very well. I am setting at 1.5 trill power. 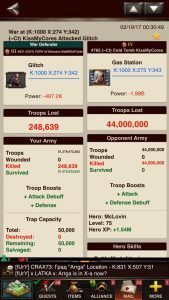 I was only losing between 32,000 to 450,000 troops per hit which were only my t1 cushion. 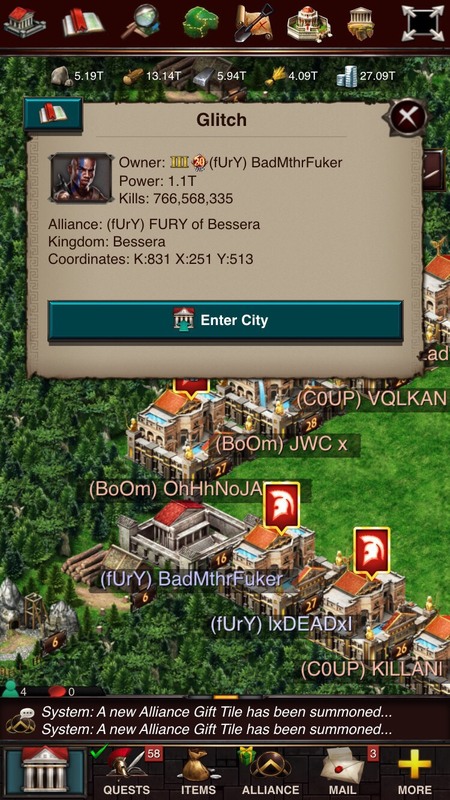 I did not build any troops during the kvk. Power loss was 84k to their 2 billion. I got so so many emails asking me how I was able to do it when I do not have all the research and etc the big guys do. Have fun and know your account well. You do need to do testing to find that sweet spot. It will be different for everyone. How do you get Haunted Frostlord gear? how much did you need to adjust it by? 1.4 bill of each t3 troop and boosted my defense on each barrack higher 20 to 25%, archeology building to max for health and attack, wall and embassy also boosted higher (wall 65% and embassy 57%). I have 27 barracks. since I had to buy one pack, I had enough VIP points from collecting them and from purchase to get VIP 35. I used every VIP point that I had collected over the last two years. This account was an old farm account that I had been collecting things with. My thumb is certainly sore…lol my power is high but I have found that I get a ton of heroless hits and solos. Like the article says, you cap a solo and then the fun begins with rallies. I capped our best wonder leader twice because he could not believe it. I was taking 50 mill rallies all day yestday. Yes, I adjusted my troop count but I am still capping. I’d be interested to see the update to this in terms of how many more troops are now needed to make this viable just two weeks after the date of writing because there’s no way that this set up wouldn’t burn (and burn badly) now. To be honest I suspect it wouldn’t have stood up to a properly set up rally leader two weeks ago either. There is no way that an SH16 could have anywhere near the defence boost required not to be completely zeroed by a good (for which read well-funded) rally lead even allowing for the debuff resistance afforded by the kunai (making the advise over what gear to wear pretty irrelevant). Last night’s addition of an minimum extra 10000% attack from level 30 alchemy lab means that most rally leaders are going to have combined attack boost comfortably in excess of 70k (some will be much more very soon). 70000% x 50 million T5 is roughly the equivalent of 65 billion T3 your numbers show a defence with the equivalent of 47 billion T3 (adjusting the T2 numbers appropriately) with effectively zero defence boost. To get a target to burn an attack doesn’t even need numerical superiority at that level, you just need to kill more than the rally size you attack with. This set up won’t just burn to a reasonably good rally, it’ll be devastated. So how many more troops will be required for this to work? And how many hours of clicking will be required to get them through the level 16 barracks queues? NB: Leaving this article up without posting a warning at the top of the page about it being out of date already is irresponsible so please do that at your earliest convenience. Dumb question but am I missing something? Have you always had to be SH 21 to do Defense Research or is that new? Is this without any defense research? I wonder how to set up a health trap? Can I do the same with my stronghold 19 account. And how come it will not be nerfed.?? Suggestions for hero and VIP level for this setup? I have one of these sh 16 traps too. It’s super fun. People are quick to try and swat me out of Wonder without paying attention to my size. I also find I can execute whoever I want, unlike my other traps, because the people who are slapping my Willy-nilly without looking at my size also are not looking at my graveyard. 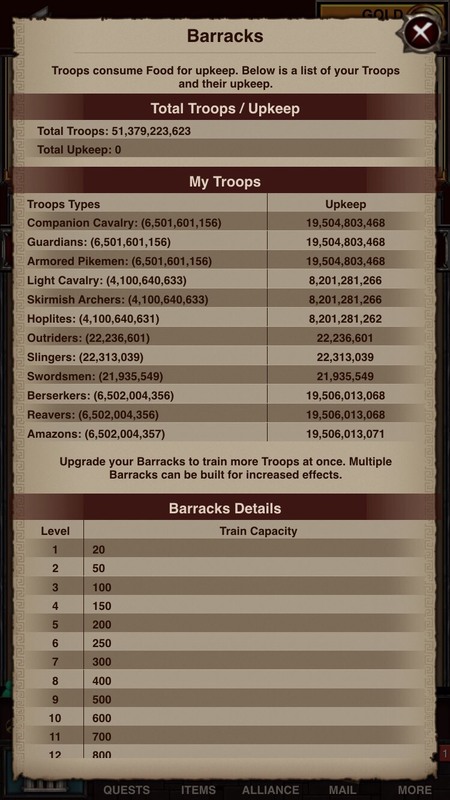 What is troop type breakdown? Sorry, it should be up now. Hello I can’t see the troop breakdown …. where can I find it? 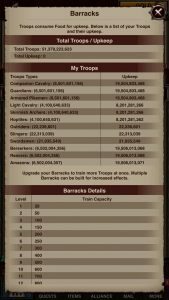 There is a screen shot of troop breakdown, at the end of the post.